If you’re anything like me, the sight of your child with their bottom lip pushed out, flat out refusing to budge is enough to get your blood boiling. “NO! and you can’t make me…” they shout back at you. We get triggered by that word NO! “BUT! I’m asking nicely, I’m empathising, and I still get resistant. My child is still not listening to me!! !” you might say. DID YOU KNOW THAT A DEMAND AND A REQUEST CAN START OUT THE SAME WAY? To tell the two apart it’s important to notice what we do AFTER our ask has not been complied with. It becomes a demand if our child does not comply with our request and we go straight in with a punishment of some form. 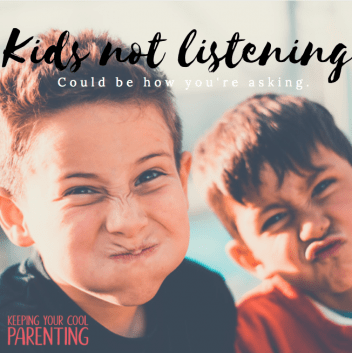 The more we have used threats, putdowns or laid on guilt trips when requesting our child comply to our request, the more our children hear a demand in our requests. We just have to open our mouths and our kids are ready to dig their heals in, ready for a power struggle. It’s a request when we pause when we hear a NO. We then can become curious to what is going on for our child in that moment. “No” is just the beginning of communication. Finding a way to meet our and our child’s needs. Want to find out how the power of communication can support you and your family? Want to know the secrets to gain willing cooperation and kids who WANT to listen to you? I would love to hear from you. Leave a comment or message me.